here, here and here .... 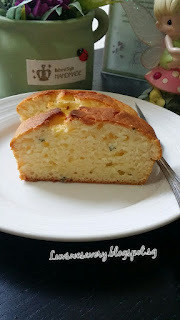 Surely this easy one-bowl and no-mixer yogurt cake caught my eyes. 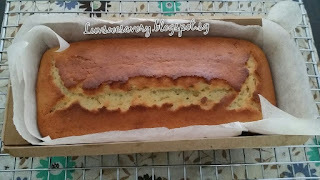 I like lemony cake, so obviously to add a little lemon zest and juice to the cake. With a little leftover of fresh rosemary herb in the fridge. .. it would be nice to add that fragrance too. 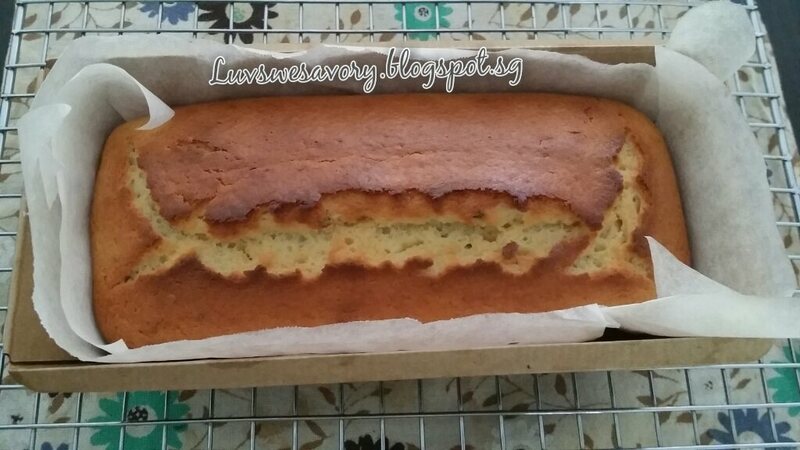 Below my slightly modified version as I've added lemon and rosemary, scaled down the quantity for a small loaf. 1) Position the rack in the middle and preheat oven to 175°C, line the loaf case with lightly grease parchment paper. 2) Put all the ingredients A in a medium size mixing bowl and whisk together until incorporated. 3) Add in the sifted flour and the rest of ingredients B to the mixing bowl. Whisk until no lumps remain. Pour the batter into the pan, use a spatula to scrape down the sides of the mixing bowl for no waste of batter. 4) Bake for about 35 minutes. 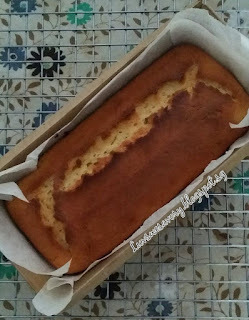 Cover with foil at the end if the top is browning too quickly. Check for doneness with a toothpick inserted into the center of the cake if it comes out clean. 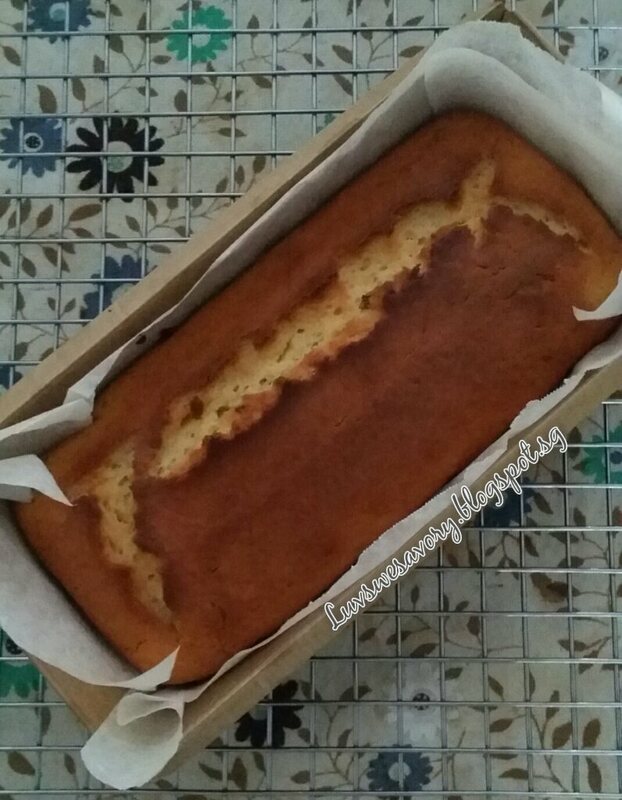 5) Transfer the loaf/cake pan onto wire rack and let it cool for 10 minutes before removing it from the pan. Very fragrance cake with a hint of tangy taste. I like the crispy crust and lightly moist texture. 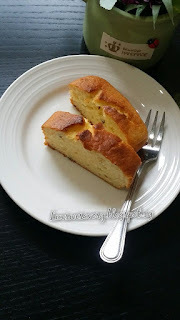 If I have guests pop by unexpectedly and wish to serve them warm cake that's quick to make, this recipe will definitely come to my mind. Enjoy ! Have a great week ahead ! The aroma of this cake must be very nice with the mixture of lemon and rosemary. I wanna try a piece too. Karen, I love lemony cakes too. If I remember correctly, rosemary pairs quite well with lemons. You cake must have been so tasty and fragrant.